13"/33cm,2018, To celebrate Gunds' 120th anniversary Gunds iconic Snuffles™ has been produced in a new softer than ever and larger size. Snuffles™ with his crescent moon shape and his ability to still look at you when hugged has been in the Gund line for over 30 years and and one of Gunds most popular and best selling designs. 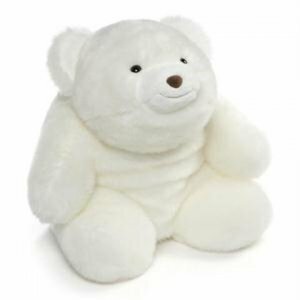 Snuffles™ has been produced in several different color combinations over the years but white has always been the classic color with his dark eyes, brown velour button nose, and his large smile. Polyester fill, surface washable, non jointed, ages 1+.